Meat raised by Montana State University students will soon be served at the university's own tables. Thanks to a partnership between the MSU College of Agriculture and the Montana Made Program in University Food Services, meat from steers in the college's Steer-A-Year program will be served in Miller Dining Commons and at other university events, and profits are used to benefit agriculture students. 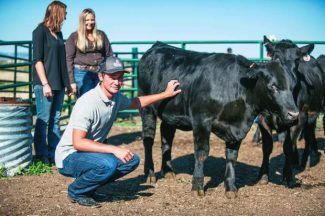 Through Steer-A-Year, students care daily for steers that Montana ranchers have donated to the university, according to Hannah DelCurto, instructor and program manager. The steers live at MSU's Bozeman Agricultural Research and Teaching Farm, or BART, farm. DelCurto said the students are responsible for everything from feeding the animals to health checks to vaccinations. In addition, the students provide data about the steers – such as average daily weight gain, carcass information when the meat is harvested and even genetic testing – to the ranchers who donated them. In the past, meat harvested from the donated steers was simply available for anyone to purchase. With a larger program this year, however – the program grew from eight animals last year to 25 this year – there was more meat to sell. So, Steer-A-Year donors suggested selling meat to MSU's University Food Services through the university's Montana Made Program, which seeks to increase access to local food products. With the help of Montana Made, approximately 20 percent of the food purchased for the university last fiscal year – or approximately $1.5 million worth of products – came from local vendors. "We're really excited about this opportunity," DelCurto said. "We think it will be a really neat partnership." Approximately 3,600 pounds of beef from the Steer-A-Year program will be served at MSU, according to Amy Bordeau, coordinator of the Montana Made Program. Pioneer Meats near Big Timber, which is owned by MSU alumnus Brian Engle, processed the meat. Bordeau said Montana Made is pleased to partner with the College of Agriculture for several reasons. First, MSU students and faculty are requesting more local food. "We are happy to provide our community with fresh and delicious foods from Montana," Bordeau said. Also important is that Montana Made is committed to supporting the local economy, she said. In addition, profit from sales of the steers will fund student activities in the College of Agriculture, and Bordeau said Montana Made is glad to support students directly in that way. Finally, DelCurto noted that because of the partnership, students have the opportunity to learn not only about agriculture, but also about business and economics. "From an educational standpoint, the students are involved in every step of creating the product, even in getting the product to the consumer," she said.